But what caught my eye was not an article or a pro event, it was an advert (the one shown here). Good for them, you might argue, but it turned out this is an ad for quite an interesting golf tournament—from various angles. The tournament is called “Ayla Jordan Mixed Open Golf Tournament” which basically tells you everything. It’s a golf tournament played in Jordan, featuring men and women fighting for the same trophy at the same time in a mixed event. “This is stemming from Ayla’s beliefs that despite their biological differences, men and women have equal power and equal opportunities for financial independence, education and personal development”, the website reads. While it’s a bit sad that the equality of men and women still is something to promote actively, it is indeed quite interesting to see a tournament organized in that fashion—and who would have thought that amongst the first ones doing that, these are based in the heartland of religious female inequality: Jordan, with the course being just 30 minutes from the Saudi-Arabian border. Before you come up with some counter arguments: I know Jordan is by far not the most religious country in that region and I actually know some very educated, western-oriented females from Lebanon or other Arab countries, very well with both feet on the ground. So the picture, of course, is not black and white, but still it is something which could be a model or at least fire spark for every golf club in your country: start with one club tournament a year in which men and women are treated completely the same and see if that’s a model you’d appreciate. Don’t take everything too seriously and just enjoy the new format. I sincerely believe this would create some headlines! Because “we share the same drive” indeed. Two weeks ago I played Schloss (Castle) Braunfels, a rather hilly course in the Taunus mountains. Last week‘s souvenir from Braunfels. Never played here before, so I got myself a ball as souvenir and played a decent round of golf — at least the first nine have been very ok, then the heat paid its tribute. Shame that they neglect the course in the heat wave currently. Most of the fairways were brown. Doesn’t look good but kicks the ball even further… I don’t have a problem with length but esthetically I prefer lush green. On hole 3 I chipped from the rough with my lob wedge, the ball went right into the cup and sprung back out. That would have been so cool. Next time. I have to say it’s difficult to accommodate a full job, a family, a house, multiple hobbies, friends and a sport like golf – oh, and sleep too. As a consequence I don’t play as often as I wish but just so often that family is happy, I’m happy and I get enough sleep at night to be fit for the office. So training is pretty much out of the picture. To put that in perspective: I’ve hit the range three times this year, short course once, private rounds three times and played nine tournaments so far of which one was a fun tournament with my company and all the others had effect on my handicap. But not now. I get some rounds in, mainly through the tournaments I play in the German Rhine-Main area. Couple of weeks ago I played Zimmerner Golf Club. Nice course, not spectacular but interesting. I played 45 stableford net points and won 1st prize. My handicap came down by 2.7 to 13.9. I was over the moon because for the last months my game struggled – I mean I struggled with my game. I didn’t practice much. But playing constantly, making the right adjustments here and there progressed and I do feel much more comfortable with everything now. Played more with thy hybrid, and plan to make my way up to the driver in multiple iterations. To kick off my tournament season earlier this year I decided to play a round at Bad Vilbeler Golfclub Lindenhof, north of Frankfurt, Germany. I played this course once before, but only for 12 holes or so. So I was excited that day, the weather was holding up quite nicely and I was really interested to see the rest of the course. In early summer, when everything is in full bloom, this course is supposed to be extremely beautiful. That day was a little different, no blossom to be seen. Great stage for today's Deutsche Bank tournament. The course is rather flat but interesting nontheless. On many holes you find water as the prominent hazard, on most holes you do find however multiple areas you wouln’t want to place your ball. The 9 and 18 really stand out in my opinion. The 9th is a par-5 dogleg right with a huge pond right in front of the mens tees. Either you are overly brave (and good enough) and drive over the water, or you lay up to the left and start to play to the right side starting with the secon shot. Great hole. What’s cool as well is the fact that you have a telephone at the tee box with which you can order something to drink or eat at the halfway house. So when you reach the 10th 15 minutes later, everything is waiting for you. Cool. The 18th is a par-3 towards the clubhouse. What makes it special is the sheer amount of water you find on that hole. So playing Bad Vilbel was a treat, a nice course, definitely not perfect but when you are in the area anyway, Bad Vilbel is a nice addition to your list – and stay for dinner if you can and enjoy the evening. In the beginning of the year I was pushing myself into as many tournaments as possible in order to gain some important tourney experience and to bring down my handicap to the level I was hoping for. 12 is the magic number for 2015, #project12 it was called, my pursuit for greatness. I’m practicing a lot, playing as often as I can (once a week) and try to get better in all aspects of the game. In the early period of the year I slightly changed my swing rhythm. I’m swinging much slower now, earning much more consistency off the tee—and I was happy as it always has been the long game I was struggling with. So from one day to the other I was dead straight and even single handicappers envied my consistency. Funnily enough this came with a complete loss of putting abilities. Don’t ask me why, but for years I had decent touch around and on the greens and now, I was just not able to execute accurate putts anymore. 3-putts and even 4-putts been the result. Whatever that is, and whatever I have to do to get rid of it, it came at very unsuitable time; my tournament season. I was down to a handicap of 14.6, now 15.1 again, although 12 was the overall goal for this year. Seems like I have to practice bit harder. Last week’s tournament has been no exception. OK, I had a little hangover and my hay-fever is killing me currently but after a stretch of good holes and 18 stableford points on the front 9, I broke down to, I don’t know exactly 9, 10 or 11 points for the second half. My game was completely wrecked, and I went home ready to cry. Nothing stops me from #project12! The relaxed rules of golf – playing the easy way! How seriously are you taking golf in terms of scoring? Always playing by the rules? Really? Always getting out a club to measure a two-club-length from a water hazard or an obstacle, even in practise rounds with your mates? Then you probably should stop reading here, because the below wouldn’t be something for you! If you do read further you could be frightened by the fact how easy and enjoyable golf can be – without drifting away too much though. At your own risk of course! Our Signature Course at Nanjing Zhongshan International Golf Club is the site of golf's entry into the Youth Olympic Games taking place in Nanjing, China. Best of luck to all competitors. Couple of days ago, the Golf Channel published a set of so-called “Relaxed Rules of Golf”. They were promoted intensively via the network and other social media channels – and to be honest; they didn’t surprise me at all. For years now people around the world are mourning about golf being too hard to play. My understanding was always, of course it’s hard when you try to play pars all the time, but that’s a great mental push and it has to be that hard! Playing a par round would be a dream coming true for me, but when everybody is true to oneself, pars are for professionals and not for weekend golf daddys, breaking in a round every 2 months or so. All the former proposals out there like bigger holes, slower balls, etc. – absolutely nonsense! Truly rubbish ideas if you ask me. When you are taking golf seriously, which is absolutely fine, then please stick to the given rules. That’s especially true for tournaments which have effect on your personal handicap. Please, learn the good old rules and stick to them when it matters. That’s not too tough, folks! And when you are penelised by the rules and you have to card down a two-stroke penalty because you did something wrong… then so be it and be honest to yourself! Simply accept it! However, what about the quick after-work 9 holes or the relaxed weekend round with some buddies? Would you totally stick to the rules as well? Frankly, I’m not! When I go out and play, I want to have fun! Sure, I want to get better, increase my skill set, lower my handicap, absolutely, but in the end of the day I definitely want to enjoy myself. Life and work is tough enough, why making our lives even more miserable with over-ruling leisure rounds of golf?! See, I don’t believe there is a black and white view in this matter. When I go out and play and I have to take a penalty for dropping out of water, do I use my driver to measure the exact distance? No. Do I throw the ball somewhere onto the fairway for an easy shot ? No… I drop the ball somewhere near the spot where I believe it went into the water and where I can hit a decent, ok-ish next shot. Is that fine with the official rules, no but it almost is and it saves so much time around the course! So there is something like a grey-area between rules and playing just for fun. Everybody obviously can interpret these ways differently but I’m sure the guy who takes golf the relaxed way has more fun in the end – and the score maybe differ by two strokes on 18 holes to the other guy who did stick to the proper rules. PENALTIES: All are one stroke, including out of bounds, water and lateral hazards, lost ball and unplayable lie. Drop a ball near where the original was lost and play on. SEARCH TIME: Two minutes to look for your ball. If lost, proceed under Rule 2. UNFORTUNATE LIES: With your playing partners’ consent, balls may be dropped out of divots or footprints, away from tree roots and any other dangerous lies. CONCEDED PUTTS: Putts may be conceded with your playing partners’ consent. EQUIPMENT: No restrictions, including number of clubs. COMMON SENSE: When in doubt, use common sense and fairness. The idea behind these relaxed rules, Ginella and Rymer explained, is to make the game more fun for those already playing (and not at an elite level) and to also make the game less intimidating for those learning to play. And to be very frank here, personally I’m sort of sticking to these rules already for years now in private rounds! 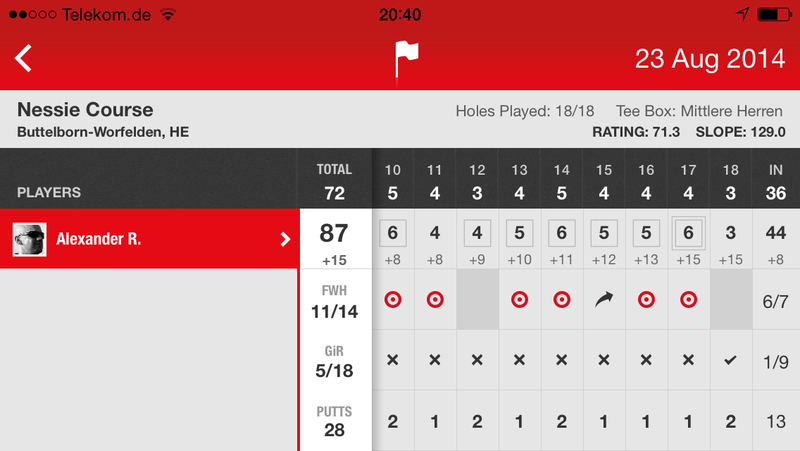 Double par is nothing I really aim for but it’s a nice thing to just pick up the ball when you reach that score. Will clearly speed up the game! When I in some instance decided not to play a provisional ball and would not be able to find the first, then obviously I play a second one from the spot I believe I lost the first one. Who on earth walks back 250 yards to the tee box in a private round?! I never looked for a ball for 5 minutes as stated in the official rules in my whole life. As this is in the interest of everybody’s game, I believe nobody would have reasons not to accept a playing partner’s wish to drop away from a cart path, tree roots or any other unfortunate or dangerous lie. Obviously not valid for tournaments, but when you are out there with your buddies and they leave themselves with a 5-inch tap-in, what do you do? Exactly, that’s simply a gimmie! I’m actually carrying more than 14 clubs currently – because I’m testing out some things with long irons and hybrids. Why shouldn’t I? I believe using brain and good manners is always a good idea… in all parts of life. And the golf course simply reflects a big part of my life. Summing up, I do believe if everybody could commit to a quick and fair play, we all would have more fun on the course and would think more positive about all the bogeys we score. Who needs over-sized holes or weirdly slow balls?! Stick to the fundamentals, play at reasonable fast pace with common sense in regards to rules and etiquette and treat your playing partners with the exact manners as you wished to be treated. As an employee at Deutsche Börse I was invited to take part in the 2nd Deutsche Börse Golf Day last Thursday. Last year I had to cancel because I couldn’t make it from London to Frankfurt. This year however I had big hopes for a great day. Mainly because I wanted to get to know more people within my company who play golf, but as well because the course was new to me, the game mode was also and just because currently I’m really crazy about golf. Deutsche Börse golf tournament later today. Perfect weather and basically the best way to spend a Thursday afternoon: on a golf course! The course we played is the Golf Club Hof Hausen vor der Sonne, even for German clubs a very long and unusual name. It’s situated in Hofheim, just outside of Frankfurt. And it’s a proper members’ club – that’s what you realise when you drive through the parking lot and your car is basically the smallest and oldest between all these brand new Porsches, BMWs and Audis. Membership costs you 30,000 EUR I was told later!! Absolutely crazy, but unfortunately very common in and around Frankfurt. But anyhow, the people I met were very friendly and the club/course was in very good condition – and that’s basically what we were after that day. The tournament was played as a Texas Scramble. Two of my playing partners I already knew, the other one was a colleague which they obviously knew very well and hence we had great fun right from the start. Right from the tee box 1 to be precise, where we started the round with a sip of Whiskey. The nice thing about a Texas Scramble is that you think and act as a team, you discuss course management strategy, putt lines and approaches. You feel a bit more pressure on the one side because your effort counts for the team. On the other hand, if you don’t sink that putt, there are three other guys who might. That was really the best part of the tournament. Hole 7 at the Deutsche Börse tournament at GC Hof Hausen vor der Sonne. Golf Club Hof Hausen vor der Sonne is a very nice venue and worth the play if you are around. The practice areas are huge, the course is not overly spectacular but far from boring and the restaurant serves German, Italian and Indian cuisine – a little weird but delicious combination. After all it was a great day. In the end – the last 4 holes I’d say – the weather got worse and we had to get out umbrellas and rain gear, but we had loads of fun. Score-wise we scored a 5-under par for the team, 6 birdies, 1 bogey. That were 41 gross points and would have put us on top of the leaderboard, but as it was an amateur tournament the net points counted and there we ended up 3rd place with 57 net Stableford points. Not too shabby at all!! I can’t wait for the next Deutsche Börse Golf Day!